When your workforce is needed onsite, and many kilometres from the nearest town or site accommodation, you need a reliable transport option. This is when partnering with a reliable transport company which has local support and national outreach makes good sense. When you’re operating in a tough environment, all onsite vehicles have to be equally tough and able to meet specific site requirements. Rentco has a 25 seater bus rental option which can move larger groups of people to and from or around site, safely and in comfort. If your workforce operates in difficult, or extreme weather conditions, you have a duty of care to make sure they’re travelling safely when they set off or return from a shift. Our 25 seater hire bus is a practical solution for getting your crew safely to where they need to be, on or off site. At Rentco, the safety and comfort of your workforce is a priority. While our 25 seat hire bus can accommodate 24 people plus the driver, we suggest a maximum of 21- 23 passengers for ultimate comfort. This rental bus comes equipped to operate onsite. It has canvas seat covers, seat belts, air-conditioning, a UHF radio so that the driver can keep in contact with other vehicles or central control. A first aid kit is on-board, and there is room for tool box storage. If you’re carrying a lot of kit, there is a tow bar for a utility trailer. These 25 seat rental buses are equipped with call sign decals and mine spec high-vis fluoro stripping for maximum visibility even in overcast or dusty conditions. They also have mine spec lights and a reversing squawker for the safety of onsite personnel. With Rentco, local accessibility with the bonus of 24/7 national breakdown support service at no extra cost. 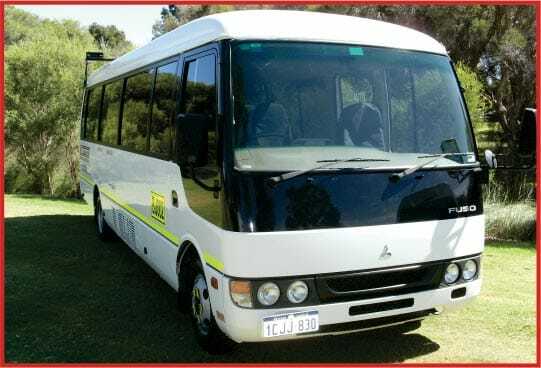 Our modern fleet of well-maintained 25 seater rental bus are available for long or short them hire from our outlets in Perth, Adelaide, Melbourne, Sydney, Brisbane, Townsville and Darwin. Contact us today about your transport needs.